Would you know at first glance that not everything on this platter is homemade? Okay everyone, I have a confession to make. You all know I love making as many recipes as I can from scratch, but honestly, who has time to be Lil Suzy Homemaker every day of the year? Add all of the holiday to-do lists and activities on top of this and time is even more of a luxury. However, we still love entertaining during the holidays and having several friends over for appetizers and drinks. Going back to my original conundrum, as much as I love eating holiday appetizers and coming up with new ones to make, they’re really time consuming to put together and keep warm all at the same time. One of our favorite appetizers that I love so much I can turn them into a meal are egg rolls and spring rolls. I love the crispy crunch of the wrapper while the filling is packed of meat and veggies in a tasty mix. I’ve made them many times before but it is again so time consuming. You have to get your wrappers ready while taking special precautions that they don’t dry out. Then you have to make your filling which usually involves a lot of chopping, dicing and mixing. Then you have to put just the right amount of filling into the wrappers and seal it all up. And lastly there’s the frying and trying to keep them all warm. Plus, you can easily make what feels like a ton and it’s still not enough. Yep, that one appetizer can easily take an hour or 2 alone! 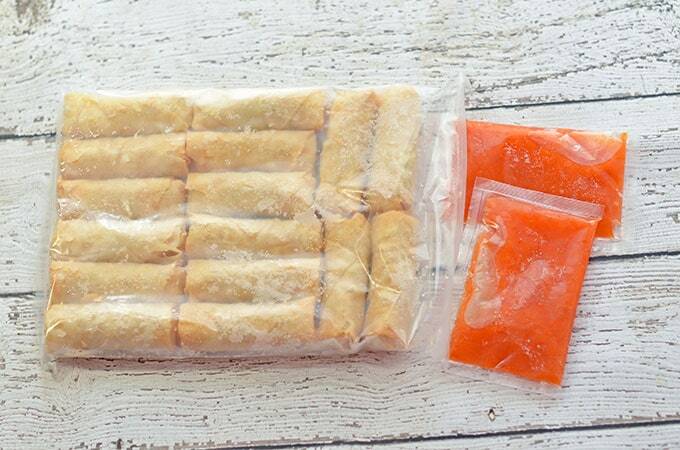 I love that the spring rolls are kept in a plastic baggie, especially since the freezer in our rental doesn’t always completely seal. So, I now pull out my secret weapon. Yes, I “cheat” and use Rich’s SeaPak Spring Rolls. Now, don’t boo me yet. You all know I’m very picky about the few pre-made foods that I eat, so you know this one has to be great. And it really is! 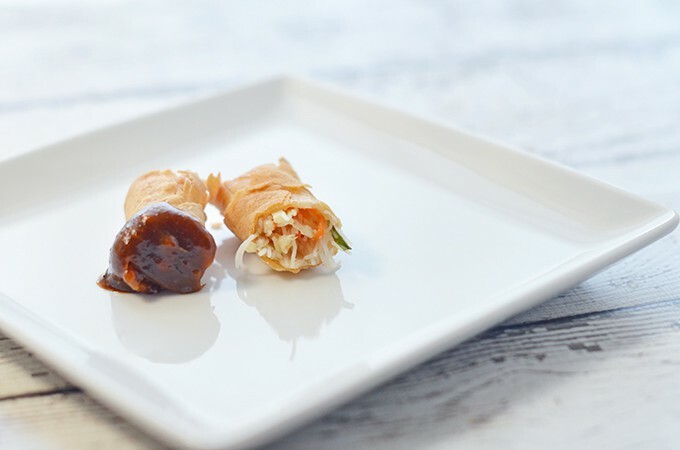 It’s full of everything I look for in a perfect spring roll: crispy outer wrapper that is easy to bite through and a very generous filling that has ingredients like shrimp, noodles and vegetables that are actually still crispy. Plus, I was able to buy them at Walmart while I was picking up some affordable chips, sodas, and plates for our holiday parties. If you know me, you likely know I want to make at least one part of this appetizer dish homemade to still make it extra special for guests. So I go the easy route and make my own dipping sauce. 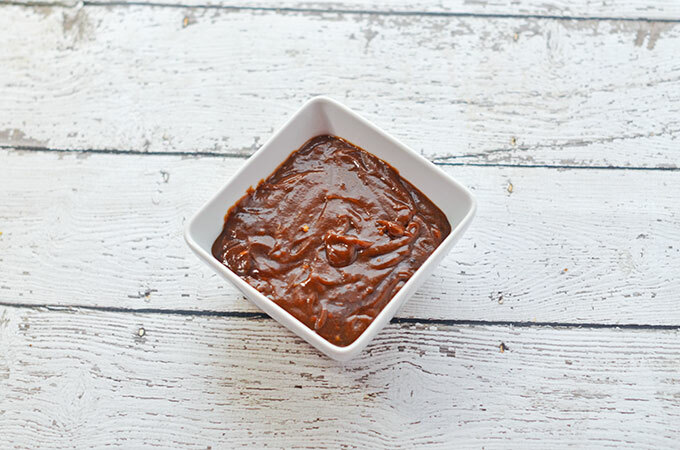 It may not look like much, but this Spicy Hoisin Peanut Dipping Sauce recipe pack quite the flavor punch. 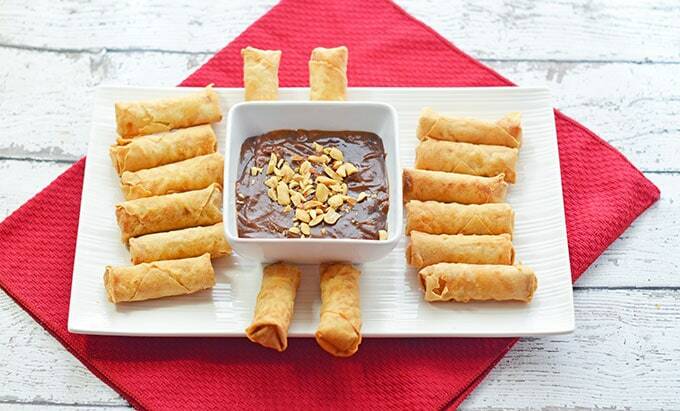 The Spicy Hoison Peanut Sauce is divine and goes well with these spring rolls to provide a bit extra oomph of flavor without being too sweet or overpowering. We do like spicy foods, so I put in a good amount of crushed red pepper flakes, but you can of course go easy on them or omit all together if you or your guests aren’t a fan of heat. If you like a super smooth dipping sauce, you can also give it a whirl in the food processor or blender, but I like it to have a bit of texture and be able to see what’s it in, so I just mix it together and put it in a pretty bowl. Then I topped it with a few chopped peanuts and red pepper flakes for garnish. I wish I had also thought to pick up a green onion to chop up on top for a bit more color. I love that these spring rolls are super crunchy while containing a lot of filling! Place your dipping sauce and fried (or you can bake them) spring rolls on a nice platter and no one has to know that it’s not completely scratch made. You can also cut them in half before plating if you’re serving one-bite appetizers. Honestly, they’re so good I think I’m going to have to keep a box on standby in the freezer for when some unexpected guests stop by or those crispy fried goodness cravings hit. As for the sauce…well, I’m pretty sure I’m going to be dreaming about what to slather it on next. 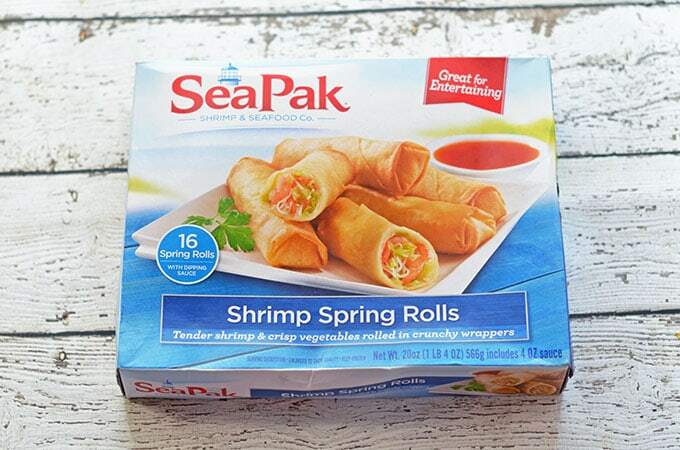 ;) Want to try Rich’s SeaPak Spring Rolls yourself? Head on over to your local Walmart on December 8th 2013 between 1pm and 5pm and check out the product demo that will of course have samples available! You can also find out more about SeaPak by checking out their Facebook and Twitter pages. If you’d like to check out more frozen appetizers, I thought this list of the 15 best frozen appetizers to serve at a party was quite interesting, plus the spring rolls were on the list. This Spicy Hoisin peanut sauce is so good you'll be having dreams of what to slather it on next! Cook spring rolls as directed on package. In the mean time, combine all spicy hoisin peanut sauce ingredients together, except for garnish. Mix together thoroughly with a whisk or fork if you want it a bit chunky, or in a blender or food processor if you want a smooth sauce. If the sauce is too thick for your liking, add in 1 Tablespoon of warm water at a time until the desired consistency is reached. Place into serving dish and top with any desired garnishes. Leftovers should be refrigerated and can be heated up on the stove or in the microwave. The sauce can be made ahead of time to allow flavors to meld and stored at room temperature if you make it the day of your party. Now I know what I want to do for this weekend! This is wonderful – I love shrimp spring rolls, but wasn’t about to make them. The dipping sauce is so perfect, I want to try these rolls asap! I am definitely picking myself up some of these- thanks for sharing! Janet, I think these would be just as good without all the spice! Is Hoison considered a Thai dish? I am learning to love peanut sauces. These would be great at my New Year’s eve “party” I have with my family every year. Great recipe! Ashley, I think that Hoison is Chinese. Yes, I am totally going to make this again for New Year’s!